As I prepare for my surgery, the experience is vastly different from my last mastectomy. First, I actually got to choose my surgeons and meet with them (two wonderful women) several times. At our final meeting, I’m given a bag with treats, complimentary things that will make my recovery easier and more comfortable. I’m stunned to see two pink heart shaped pillows for me to cradle under my arms. These pillows have a much deeper meaning to me than to other women who receive them. Here is another brief excerpt from my book to tell you why. After surgery, the surgeon said I need a pillow to cushion my arm and provide protection and comfort. No pillows allowed in jail. That would be luxurious, even for a cancer patient. I tell the girls and they are silent. I know they feel helpless; so do I. I can’t even get Medical to check my incision, let alone find me a non-existent pillow. However, a couple of hours later, four young women come in to my cell with an order. “Close your eyes,” said Roxie, “and hold out your hands, Sue Ellen.” When I do, I feel something soft. I look to find the most beautiful pillow I have ever seen. It is light blue, tufted and fringed, made of the Kotex furnished by the jail. The women contributed their precious supplies and wove them together to form a tufted square. Then they used the small golf pencil that we are allowed for our writing tool to punch holes in the ends of the pads. They took thin strips from another pad to use as thread to sew it all around. Finally, they fringed the end material to give it that designer look. Honestly, I’ve had beautiful, expensive pillows in my life, but never one that held so much love, creativity, and generosity. I treasure that pillow and hide it under my smock when the guards come to search for contraband. At a terrible time in my life, it provides indescribable comfort and I will never forget it. 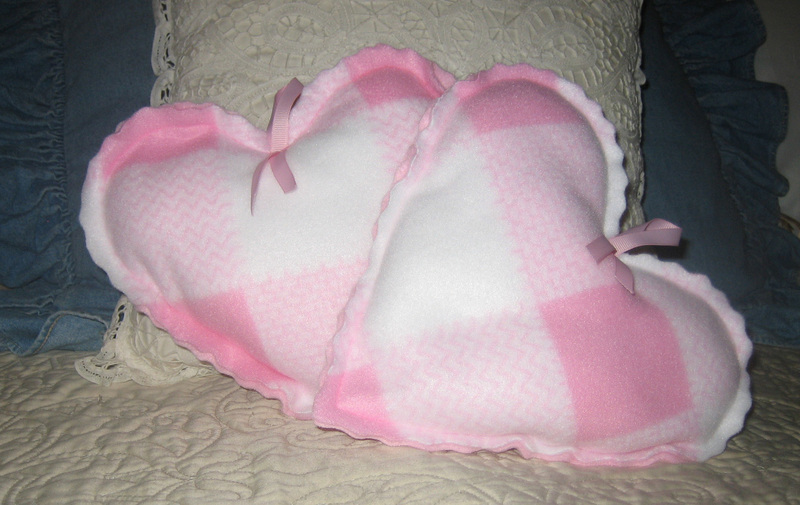 The pink pillows I’ve been given are made with love by women at the Bernina Center. I am very grateful for their gift. But I will never forget the pillow made for me at the jail, a gift from those whom society considers the lowest of the low, the addicts, prostitutes and thieves. If they had been caught, they would have faced considerable trouble. Those women risked a lot to help and comfort me. I have no idea where they are now, but they are forever in my memory and my prayers. I live in gratitude. On September 26, 2002, I was awakened at midnight to begin one of the longest days of my life. I spent the next 17 hours making my way to the operating room of the hospital for a mastectomy. The following is an excerpt from my book, The Slumber Party from Hell, about the experience. Why am I posting this today? Please read to the end to find out. “It was not the way I pictured it. Because I am an inmate awaiting sentencing at the jail, there is a procedure. I feel terribly alone, but I am ready. I know the drill. All the trips to the hospital are made this inhumane way. At two in the morning, I am shackled, cuffed, and led to the bus with forty-nine other women for the fifteen-minute ride to the old jail and courthouse. We wait in the old morgue that the girls call the dungeon. It is a big, cold, dirty concrete room with an open toilet on one wall. There are no chairs, just the freezing floor, so cold that it feels like an ice rink. There are little roaches everywhere, despite the cold, which you think would discourage them. Fifty shackled women: some sit, some lie down on the filthy floor, some pace despite the shackles that cut into your ankles. We’re all waiting for the door to open at four thirty. No books allowed. Time drags. At four fifteen, we’re moved upstairs, given plastic sacks of sandwich meat, bread, an orange, and blue Kool-Aid. It’s the only food inmates at court get for twelve hours or more. Daily bread takes on a whole new meaning. It was freezing in those cells. We shiver, we pray, we talk, we shiver some more while we wait for the dawn. No food or drink for me before surgery. Instead, I wait. Ten women crammed in each small cell with four bunks, no mattresses, just the cold, hard steel. For four hours, the women all sit, lie, pace, and pray. By eight fifteen, when the guards start yelling names, we are all frozen stiff, sore, and exhausted. They will go to court to face some of the most important decisions of their life and they are worn out before they start. So am I. Finally, I’m led to the hospital van, anxious and alone. I think surgery is at ten o’clock in the morning, but they put me in another concrete holding cell alone and I wait and wait some more. At noon, I ask, “What’s happening? How long?” They give me no answer. I am cold, hungry, scared. More time to pray and I hold a one sided conversation with God. God, this would be a great time to take me home, to let me see the light, to let me rest in your arms. But, if I wake up, I’ll know you aren’t done with me yet. About three in the afternoon, a guard comes to tell me they had an emergency, but I’ll be going soon. I haven’t eaten in twenty hours; I haven’t slept. Freezing and facing surgery alone, I am afraid. Finally, at four o’clock, I am taken down to Admitting and the Operating Room full of surgeons, nurses, and my guards. Still shackled, I put on the hospital gown. For the first time in three months, I see myself in a real mirror. My hair is just gray fuzz, I’ve lost twenty pounds, and my muscle tone is gone. I look like a stranger. I look at my breast for the last time. How do they dispose of it? Does it go in the trash? The girls say it’s going to Booby Heaven. Finally, it’s time, time for the I.V. Dear God. Four veins collapse. Digging, poking, crying, shaking. Stop! It hurts. Please, please, knock me out first and do the I.V. in the O.R. Finally in the O.R., the shackles come off as I go under. I wake up five hours later upstairs in the jail ward, bandaged and sore, but alive. Next week, I’m facing surgery again, coming full circle. Because my cancer was advanced, I’m having a second “preventative” mastectomy followed by reconstruction. I admit to mixed emotions. In 2002, the surgeon gave me a 60% chance to live five years. It’s actually been eight and I am thankful to be alive. But I’ve been lopsided for eight years. It will be nice to be balanced again. Next week is Thanksgiving and I am writing this to share my gratitude and joy over this surgery. Why? Because, instead of black and white stripes, shackles, belly chains, handcuffs, and aloof jail guards, I am going to the hospital in soft, comfortable clothes with my husband and friends. Yes, I’m nervous, but I am so very thankful for this opportunity and the loving support of friends and David. This Thanksgiving I am counting my blessings. It will only be two days after my surgery and I may be sore, without an appetite for turkey, but I have a roof over my head, a warm shower, hot food and loved ones. When I think of lonely holidays in prison, and people like Tara on the streets, I am so thankful for every blessing, particularly my family and friends. Every little girl, every teen, and every grown woman dreams of being “made-over.” And every prisoner dreams of it too. After all, inmates dress in ugly orange uniforms, have hair cuts from inmate “barbers” with no scissors, only clippers, have minimal hair care products and no color allowed. Make up is minimal too. The inmate store sells one color of lipstick, a sort of “purpley” reddish color that is hideous with orange. It’s all pretty depressing if you want to feel pretty. So imagine my delight last week when my friend Neesy asked me to join her in a make-over for breast cancer survivors. As an eight year cancer survivor, I am just happy to be alive. Made-over sounded like heaven. We were to get the “works” from that very chic salon, Mane Attraction, and then appear on Channel 3 ( http://www.azfamily.com/on-tv/your-life/ ) to show off the before and after looks. I was thrilled to be so pampered. And pampered we were. We got cuts, color and make up. Marissa approached my hair like she was creating a work of art and I felt like she was cutting each hair individually. She consulted with the owner, Kendall Ong, who is THE EXPERT on color and they decided “brighter, deeper, and richer” would go with my skin tone and eyes. Who knew? Next I got beautiful make up by Megan, the salon expert who gave me amazing eyes and a very nice skin tone. I asked her if she could do something about the wrinkles, but she only had a mascara wand, not a magic one. Finally, Kendall put the finishing touches on both of us and off we went in our magic carriage, I mean mini-van to the studio. Filming with Lisa Haffner, host of Your Life A to Z was great fun. She’s a real pro and it was obvious that she and Kendall worked well together. Neesy and I weren’t miked. Our challenge was to stand still and smile, not as easy as it sounds. It was all over in four minutes. Neesy and I are so grateful for all the loving attention we received from Kendall’s team at Mane Attraction. They must be very content working in such a lovely environment and making people look beautiful. It’s a little like being a fairy godmother. I definitely felt like a princess. I just wish I could wave Kendall’s magic wand over the entire Perryville prison and make-over everyone there. Now that would be true magic.